Three leading FabLabs from Derry~Londonderry, Limerick and Madrid have come together for a unique international programme of art-making, exhibition, training and networking, that will benefit local artists and young people. Future Artist-Maker Labs will give artists from across Europe free access to the latest digital fabrication technologies and materials for art-making through FabLabs at the Nerve Centre, University of Limerick and Ultralab, Madrid. The project will include artist residencies in each of the FabLabs during which established international artists will create new pieces of work for display in a major touring European Future Artist-Maker Exhibition scheduled for late 2016 / early 2017. Future Artist-Maker Labs is led by the Nerve Centre, and funded by Creative Europe, the former Department of Culture, Arts & Leisure, Arts Council of Northern Ireland and the Acorn Fund. Dublin-based conceptual artist Jim Ricks has recently been artist-in-residence at FabLab Nerve Centre. Inspired by the city’s mural art, Ricks created a new mural on a gable wall in Riverview Park using stencils laser cut in the FabLab. 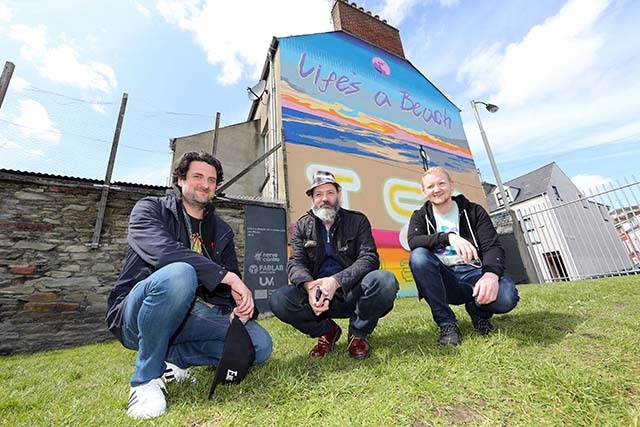 The mural has a retro design, with 80's era hot pink lettering and an image of an aspirational beach surfer lifestyle, with the wording 'LIFE’S A BEACH – ART IMITATES LIFE’. Ricks also used 3D-printing technologies to create a range of art works, including a bronze replica of Michael Collins’s nose, based on the bust of the Irish revolutionary leader on display in Merrion Square. During the artist residency, 12 young local apprentices aged 17 -20 were taken through an accredited training programme in Digital Fabrication, part-funded by the Community Foundation for Northern Ireland’s Acorn Fund. The apprentices worked alongside Ricks using state-of-the-art digital manufacturing technologies, open source design software and a selection of computer controlled machines including 3D printers, laser cutters, milling machines and CNC routers. The project’s Community Creative engagement programme is also giving artists and creatives in the North West free access to FabLab equipment for art-making to challenge and expand their art practice. David Lewis, project lead at the Nerve Centre, welcomed the launch of the project: “We are delighted to be working with University of Limerick and Ultra-Lab, Madrid, on this unique Creative Europe funded project. Future Artist-Maker Labs will foster international networking between three former Cities of Culture and project participants, sharing expertise and good practice in art-making and fabrication.